More than 8 million tons of plastic are dumped into our oceans every year. Plastic wasn’t popularized until the 1950s, and today we are producing this incredibly versatile product at an alarming rate. 300 million tons of plastic waste is produced every year now, and half of that production is dedicated to single use products. We all must understand the extent of the problem.. According to the Container Recycling Institute, 100.7 billion plastic beverage bottles were sold in the U.S. in 2014, or 315 bottles per person. In 2013, Americans generated about 254 million tons of trash. 87 million tons of this material was recycled and composted, equivalent to a 34.3% recycling rate. HOW DOES PLASTIC GET INTO OUR OCEANS? It has taken humans 60 years to create over 8.3 billion metric tons of plastic. 6.3 billion metric tons has become plastic waste. Of that astronomical number, around 80% of the waste will end up in our landfill and our waterways. We have grown accustom to the “disposable” lifestyle, and estimate 50% of these plastics are used once and then thrown away. This waste has many avenues to reaching our oceans and our waterways, that has a real detrimental effect on our ecosystem. Garbage, littering, and plastics getting flushed down drains are just a few of the ways that it reaches our waterways. 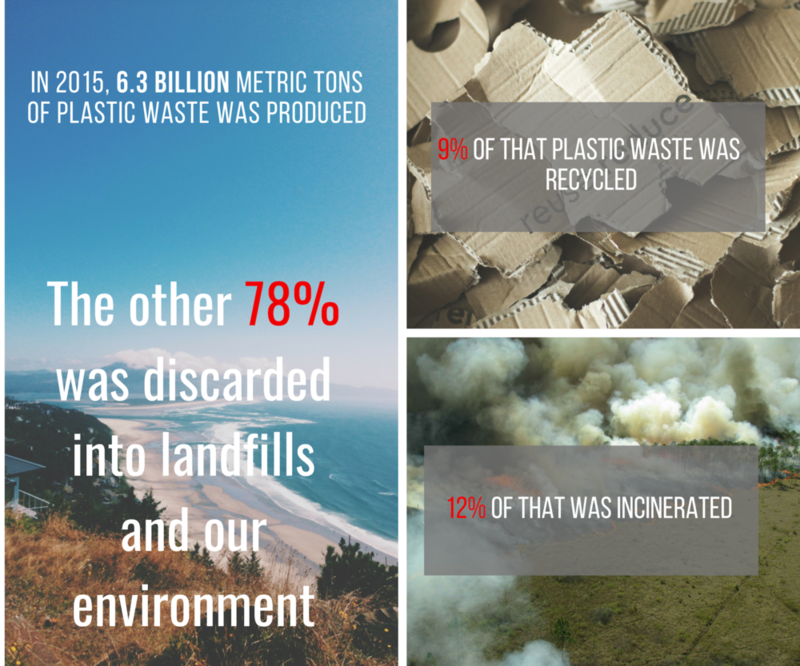 Stats show that only 9% of this plastic waste is recycled, and the rest is left to be burned or put in landfills. Both of these methods are not very good. When plastic is burned, it releases dangerous chemicals such as hydrochloric acid, sulfur dioxide, dioxins, furans and heavy metals, as well as particulates. These emissions are known to cause respiratory ailments and stress human immune systems, and they're potentially carcinogenic. [MIT] When it reached the landfills the problem doesn’t stop there. The lighter plastic can be blown from the trucks delivering the garbage, as well as landfill plastics being carried away by the winds. As the plastic begins to degrade deep in landfills, harmful chemicals can leach into the surrounding area causing a contamination of the soil and the groundwater. From land to sea, litter is a huge problem! It comes in all different shapes and sizes. We litter on land, as well as in the seas and waterways. Marine litter has a direct and immediate impact. “Globally, rivers carry around 1.15-2.41 million tons of plastic into the sea each year.” [Green Peace] Trash that enters the waterways can travel as far as the Arctic. As small plastics are carried by currents, fish and birds will often mistake the bright colored objects as food and will swallow them. This can cause the animal to become sick, and lead to death in many creatures. Plastic bags are a large concern for their large chocking and asphyxiation hazards, as animals will mistake them for jellyfish. Nets and fishing debris are very dangerous to the marine life as well. Turtles, dolphins, fish and coral reefs have been affected by the commercial fishing industry. Land litter may often have the same fate, ending up in our sewer drains, rivers and waterways. High winds and large rainfalls can take litter from the land to the sea quickly. Our network of drains often lead to streams, rivers, lakes and oceans. We many not think of our washing machine, our shower drain, or the toilet as an avenue for plastic to enter our waterways but thats far from the case. Very small objects such as the micro-beads that were in cosmetic products, washed down the drain, and be released into our waters. This was causing many small fish to eat the particles, and beginning to work its way up to food chain on to our plates, and into our bodies. Small plastic wrappers and trash can be flushed down the toilet, entering our waters. Even glitter is considered a micro plastic, and will often times be washed off in the shower, or down the sink drain, and face the same fate. Washing machines are adding to the plastic pollution in an obscure way. As clothing is washed, it releases tiny plastic fibers in the clothing, that are taken through the drains. When these fibers make it to the water treatment facilities, they’re too small to be filtered and make their way back into our waterways. Mother Nature needs our help! The stats are staggering! there’s no doubt about it! We as a civilization did this to ourselves and we’re the only ones who will be able to fix it. There is hope but we must act now! Our oceans provide us with 50% of the oxygen we breath, and we need to stop polluting and start taking care of it! We need to stop treating our oceans like giant trash cans and it starts at the source…. We may all not be able to work beach clean ups, or start a large scale recycling program in our district, but we call can all play a roll and do our part! There’s no one single person that got us into this plastic pollution problem, and there will be no single person to get us out of it. It will take a collective effort from all of us! We as humans are the most innovative and resilient creatures on this planet. We have the ability to touch the moon and study the bottom of oceans, and we have the ability to take back our oceans from the rough situation that we put her in. The large stats of our pollution can be scary, but now that we know the extent of the problem, we can begin to change course on a path to a greener future. The following four items we will show, touch our lives every day, and we have the power to fight the stats! Every straw thats recycled, or cloth bag that is taken to the store is a victory in our fight against the numbers. We can do anything we set our mind to! Could be removed from the environment if one person used a reusable bag over their lifetime. Often times, we really don’t need a straw with the beverages that we enjoy. If you need a straw to enjoy a specific drink, buy a few reusable ones for your bag, home, and workplace. Metal and bamboo straws work great, and they can be recycled or composted later. Plastic cutlery falls into the same type of fight as the straw battle. As the rise and ease of the food delivery market rises, we need to remember that a large number of those deliveries will have plastic utensils. Keep some metal silverware in the glovebox of your car, or in a drawer at the workplace. Saying NO to plastic utensils is saying YES helping our environment.